We made it to Penang Island, Malaysia and are excited to explore our home for the next four weeks. We spend the first couple of days settling in and coming to terms with the high humidity (think of those handful of Midwestern summer days where everything crunchy in your cupboard goes stale in hours – that is every day), getting Malaysian SIMs for our phones (cheaper even than Thailand), shopping for groceries, and swimming in the pool. Since we are farther out in the suburb of Gelugor, our trips to sightsee will be more planned than in Chiang Mai. Packaging glue is something to be reckoned with in Thailand, especially when it comes to pre-packaged snacks. I don’t know why chips need to be childproof, but I needed scissors to open them. Every time. I feel so weak. 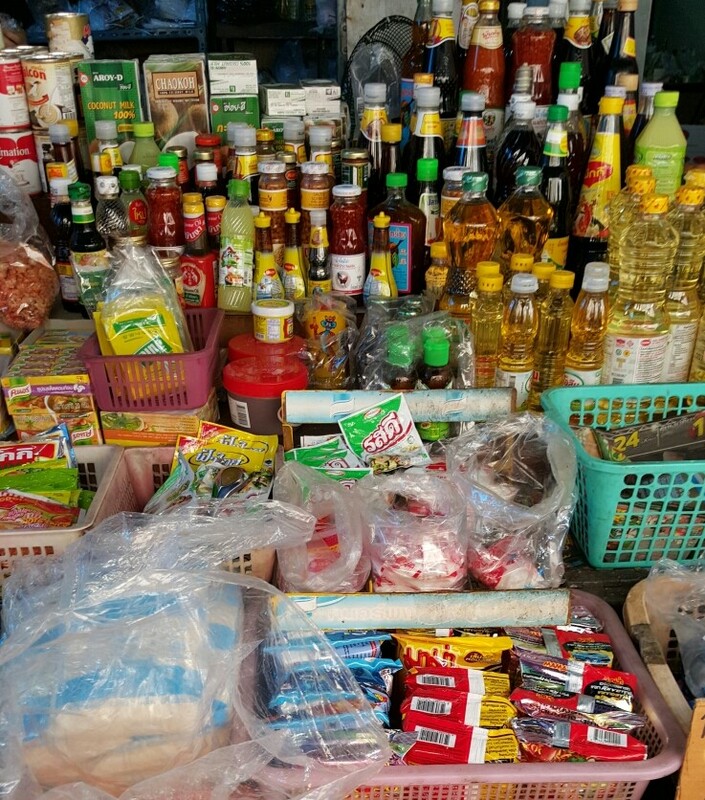 There are so many snack flavors – various seafoods, hotpot, hamburger, bbq, extra bbq, nori seaweed, corn soup (that one was on a bag of popcorn), miang kham, cheese ice cream. Even chrysalis snacks for those willing to eat fried bug larva (it wan’t as tasty as I hoped, but I can see it being better freshly fried or as a topping). Forget credit cards and carry cash, preferably small bills. ATMs only want to give out 1,000 baht bills, so you have to break them at 7-Eleven or another chain store. Then you can go to the yummier places to eat with all the 100 and 20 baht notes you get as change. Offering left at the base of a tree, the best restaurant name we saw (though we did not eat there), readily available electrical outlets for phone plugs, Star Wars hype at one of the malls. It is incredibly common to have dual-purpose outlets that support North American plugs without adapters. So that those converters you purchased are wholly unnecessary. Just toss the doohickey in the garbage, plug your phone into the wall, and forget about it. Eating street food might be the biggest highlight. There is a small chance you will get sick (we racked up one case of food-related illness between us), but that mostly doesn’t happen. And the thing that probably caused it was fish that had been sitting out, for a few hours at least, on a 90 degree holiday with fewer patrons than usual. And we ate just about everything else we saw, including other fish, with no ill effects except a craving for more. There are a surprising amount of tourists/expats in Chaing Mai, and that increases ten- or twenty-fold in the Old City. And a surprising number of those are older men with Thai wives/girlfriends/escorts. It is a little bit unnerving and a little gross. Don’t get me wrong, some have clearly fallen in love and both partners are happy, committed, and enjoying each other and their family. But others… not so much. I’m especially suspicious when the age difference is more than 10 years or so. I really hope that maybe I saw the couple on a bad day or that at least they each treat the other with respect and caring at other times. But I have a horrible feeling that some are one-sided with one partner is trapped by economics, lack of education, or some equally unfair disadvantage. Lighter skin is a big deal. I think the tanning craze has been over in the US almost as long as I’ve been out of high school, but here the opposite extreme happens. Not only is a dark tan frowned upon, but light skin is the focus of a large portion of lotions and soaps. They are advertised as ‘Whitening’ or ‘Lightening.’ I’m not sure what ingredients create this effect, but sunscreen is a better alternative. Our favorite story of a monk and his need to gain weight, electrical wire chaos (yet the power always worked), skin whitening body wash. Written Thai is confusing. Words are not divided from one another in the same way as in English – so sentences appear to be one long string of letters. It makes picking out individual words impossible without prior knowledge. (**However, Thai TV is very good at being accessible to the deaf. Most news channels have an interpreter in the lower corner, and other channels, especially those showing movies dubbed from another language, will have close captions running along the bottom.) Thankfully, spoken Thai is easier to pick up and basic phrases and numbers are simple to learn in an hour or less. Street dogs are everywhere. Very few pets are leashed (and the ones that are have good reason to be) and are free to wander around day and night. In our neighborhood they bark a lot. And while their bite is not worse than their bark, they do bite. One of the larger spirit houses, adorableness. Everyone is really kind – willing to offer directions or suggestions if they see you are lost or confused, happy to work with you to get you the meal you want, and smile as you stumble through attempts at speaking Thai and nod encouragement and let you know where in the sentence you went wrong. Locals all spoke enough English to help us through our transactions. Occasionally they were hesitant to use it, perhaps because they were shy about pronunciation or grammear, but it was clear that their knowledge of English far surpassed our Thai vocabularies. Spirit houses and small offerings are commonplace. Spirit houses are usually placed in one of the corners of the property and are on a pillar. The small structures are often accompanied by flowers, fruits, open drinks, and figurines. Businesses that don’t have room out front will have a shelf set up inside with the same purpose. Offerings are sometimes left outside near doors or at the base of trees as well. It was an incredibly safe city. I never felt awkward or unwelcome or afraid walking around (though now I check twice where the dogs are at). Apparently pickpockets can strike at the crowded markets or tourist sights, but we never had need to worry. Thailand does New Year’s better. For starters, the weather is a vast improvement over any other end-of-December I’ve witnessed… no snow, no ice, no freezing temperatures, no gray Seattle fog hiding fireworks. Just a balmy 75 degrees at midnight, perfect for strolling, eating street food, and drinking outside. And midnight on December 31 is just the first of three New Year’s celebrations. Why have just one when you can also give a nod to Chinese New Year in February and have the three-day Songkran in April with merit-making, firecrackers, parades, and massive water fights? And of course, midnight celebrations are a little different. We went to the Tha Pae Gate to celebrate. The area had already been setting up for the events days in advance – a small market sprung up last week along with more street food vendors than usual. A main stage was erected, and was occupied by a famous or semi-famous Thai singer and band for a concert the traditional countdown to midnight. Since the area is tourisy and restaurants stayed open, we ate there on the 31st (a German/Thai restaurant might not have been the most obvious choice but it was delicious) and that put us right in front of one of the main launching areas for lanterns. The first sky-lanterns go up about 7:45, just a small handful from those who could not wait or had small kids to hurry home. Then, about 9 p.m., hundreds start rising from all directions. Several other sites around the city like the Nimman Road/Maya shopping plaza and Ping riverfront/Warorot Market had large celebrations and also contributed steady streams of lights. The lanterns are flimsy, and the slightest breeze sends them into trees or power lines (of course, it doesn’t help when they are launched directly under said power lines by inattentive people and then burst brightly into flame and rain down burning ashes on the sidewalk). But once the lanterns get around any obstacles, they are absolutely beautiful. One light floats up, joins dozens or hundreds of others buoyed along by the wind, bobs along for a while, then flickers, fades, and sinks back to earth. I think it might be the most quietly joyful celebration I’ve witnessed (just tune out the firecrackers). If you look carefully, there are already downed lanterns in the water. Fireworks are not so strictly regulated, so roman candles and aerials can be bought by the side of the road, and carried around above your head as they explode in merry bursts (saw two guys doing this) or set off in the middle of the (crowded) street. It is assumed passers-by will notice and move out of the way accordingly. Most were made well enough and the explosions cleared the rooftops, but some explode closer to eye-level and sent people dodging. What goes up does come down, and after just five minutes or so. Burned-out lanterns already littered the moat and nearby trees when we sent ours up and we passed the their detritus all the way home. They skimmed along the streets the next morning, lingering gray husks of the celebration. Khao soi. Crunchy, soupy, semi-spicy goodness that seems to capture Northern Thailand in a single dish. Self-seasoning! No 1-5 stars or presumptions about how spicy you can handle. Sometimes we get asked if we would like spicy or non, and some dishes come with peppers as part of the recipe, but usually the spice levels are low (well, low by Thai standards, so really low-to-moderate by ours), so you can add more to taste. At a local restaurant, there are usually 3 or 4 condiments on the table – sugar, vinegared peppers, lip-burningly-hot crushed and dried pepper flakes, and a jar of fish sauce. Some dishes are served with their own special additions like pieces of lime or peanuts on the side. But the message is: you know how you like your food, so we’ll serve the basic components and you can fine-tune the rest. Palm sugar! Baking sugar, maple syrup, and stand-alone candy in one. It tops toast, oatmeal, or yogurt at breakfast, and fruit during the day. I’ll admit: I just eat it by the spoonful. Seaweed- and fish-flavored snacks. Uwajimaya aside, US stores should carry more of these. Crepe-like dessert, palm sugar, snake fruit, tiny bananas! Noodles. All kinds. Everywhere. Egg noodles, rice noodles, glass noodles, vermicelli, wide noodles, thin noodles, crunchy noodles, noodles in soup. Mostly fresh, not frozen or dried, and stir-fried or boiled to perfection. Tiny bananas. Sweeter than in the US supermarket and just the right size for snacking and making itty-bitty banana splits. Rose apples. Crunchy, semi-sweet deliciousness that tastes like apple blossoms, roses, and springtime. Eat it like a regular fruit or add chili powder and sugar for a local touch. Snake fruit. Strange looking with a thin scaly skin that reveals yellowish flesh that tastes unlike anything I’d tried before. Smooth and sweet-and-sour. You think you’ll eat just one, but then need another. Pringles-shaped crunchy crepe desserts. Topped with sugared egg white and coconut or sweetened egg yolks (foy tong). Rose apples, fun snack flavors, Thailand-produced wine, khao soi. Mango sticky rice. Because rice sweetened with coconut milk and sugar with mango is all the dessert you need. Coffee! Extra sugar, and often extra chocolate. Seattle is no longer looking like the best coffee city. **Shoutout to the Thai wine industry. Though we consider ourselves wine-lovers, we had no clue that wine grapes were grown in Thailand, but they are in several vineyards near Bangkok and to the south. The wine goes great with Thai food (as you’d expect). Like most visitors to Chiang Mai, we also made the trip up to Wat Prathat Doi Suthep. Located on a mountain overlooking the city, it is visible as a faintly gold-colored spire and set of buildings during the day and is well-lit at night (just glancing up, we thought it could have been a low-flying airplane except for the brightly lit chedi). The Wat is in a national park, so once we passed the zoo on the outskirts of town the number of buildings drops precipitously and the surroundings become jungle. We went on a cloudy, cooler day, but the temperature kept dropping as we climbed, a nice respite from the lowland. A few fruit stands are situated near viewpoints on the way up and the top is a full-fledged temple complex with market and dozens of food vendors. The temple is separate from most of the hubbub and is up a 300+ step flight of stairs. We paid the foreigner fee for entry at the top and went in. The courtyard is a semi-continuous shoe pile. The Wat is an active temple and so many of those visiting are there to worship. 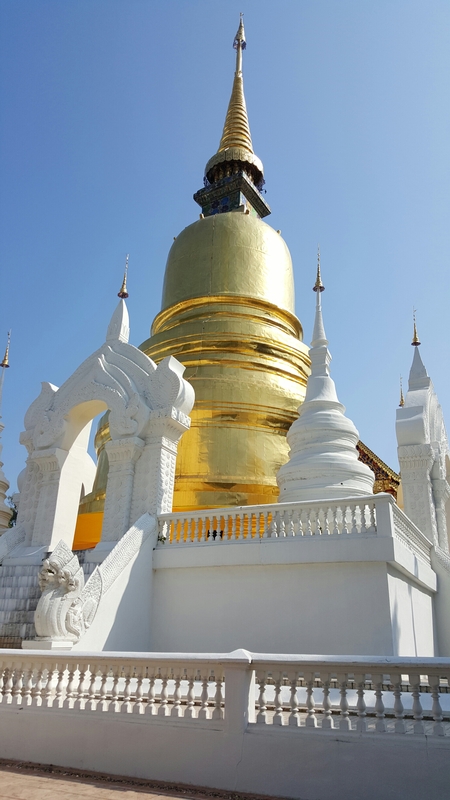 The main gilded chedi is in an interior courtyard and many take the time to pray and circle it with a lotus flower. Images of Buddha abound and, like the other Wats, everything is intricately carved, gilded, and painted and flowers and bright fabrics adorn many of the altars and trees around the Wat. Offerings of coins can be made by lighting candles and dipping the coin in the dripping wax and then attaching it to a board near one of the altars. Alternately, there are donation boxes for the various needs of the temple complex and the monks. There are also bells for devotees to ring and candles kept burning with oil poured onto them by the faithful. To the right side of the the main temple is a deck overlooking the city. The airport is visible on the nearer side of town (our temporary home is located a bit to the left of the runway). Dogs have a particularly good time near temples in Thailand. They are willing to eat anything visitors drop or give to them and act as a pet/guard dog combo. We ate lunch at the market near the bottom of the steps (and paid a higher price to do so, since the day was cooler on the mountain and though the food was not as good as the rest we’ve eaten). A word about the roads: Driving up is an adventure. We caught a red truck by the Ford dealership near the old city’s north gate. We shared the back with 7 other people (so 9 total on the way up) and were part of a group of 13 on the way down (2 were in the truck’s cab). The road up to Wat Prathat Doi Suthep is three lanes so vehicles having trouble with the grade can go slower. At least that is the theory. In practice, everyone drives in the center, even around blind curves. And there are dozens and dozens of blind curves. Even swerving into oncoming traffic we were being passed by vehicles even farther over the center line. On the way down a full-sized tour bus was stuck (with rocks under the wheels) on the final blind curve before the Wat. I hope it didn’t cause any other accidents as everyone was veering around it at speed to take the corner in the single remaining lane. Cyclists take on the mountain in high numbers, but I am not as brave as they are. We’ve been in Chiang Mai almost two weeks, and are enjoying the relaxed pace. We generally wander around the city and sightsee in the morning and then head indoors during the hotter afternoon hours and head out again for some local eats at night. Getting around: We walk because that is what we do. Here it is a bit more like hiking – sidewalks are usually narrow and uneven and are often filled with vendors (street food and otherwise, making it hard to go anywhere without wanting to sample barbecued fish, fried chicken, waffles, or fresh fruit), sleeping dogs, parked motorbikes, signs, trees, and electrical wires. Crosswalks are rare, so often we just do what everyone else does: watch for a gap in traffic, try to take into account motorbikes that appear from nowhere, and dart across to the other side. We can catch a red truck back to our apartment for about 60 baht ($2) from anywhere in the old city if we don’t feel like making the return on foot. Cell phones: It took less than 15 minutes to walk into a DTAC store and equip our phones with local SIMs loaded with enough talk time and internet access for the month. Water: What comes out of the faucet can be used for doing the dishes and brushing teeth. We drink and cook with bottled water, as locals do. Our apartment came with a case of water, but when we used the last of that yesterday we gathered up the bottles and spare change and went to the nearest bookcase-sized machine that sells filtered and purified water. On our street there are about half a dozen of them, and they charge a couple of cents per liter. I haven’t yet mastered the ability to switch out bottles while the water is still running; my skirt spent the afternoon drying in the window. Laundry: Often paired with water machines are washers (and machines to allow you to top-up your calling cards and phone plans). The washers are fancier than what we had at our apartment in Seattle – we get to choose from many more settings, some a mystery. Mostly just flip the switch, hit start, and go. The previous person wanted their clothes to come out clean, so this load probably will too. Fresh fruit & veggies: Just wander down the street and buy what you need! Dozens of vendors are in every direction, and in markets greengrocers are conveniently grouped together, making it easy to compare prices and selection. Packaged food & meats: Head to any number of grocery stores, from the 5 small & locally run ones on our street or to chains like 7-Eleven and Tops. Snack foods are big, so chips and crunchy treats are for sale practically everywhere. But wine, dairy (especially cheese and milk), western-style bread, and cereal are harder to find and as or more expensive than in the U.S. The food I miss most is large quantities of chocolate. Candy bars are sold at most grocery stores, but are imported and relatively expensive. They don’t hold up well in the summer (or winter) heat and there are other local sweet treats to try. Still, chocolate was a big part of my diet and the single-candy-bar-every-couple-of-days approach leaves me wanting more. Meals: We sometimes cook breakfast at home (eggs), but other meals are cheaper out. Especially if you are looking for pad thai or common cuisine like fried rice or khao soi, just go to a street kitchen. 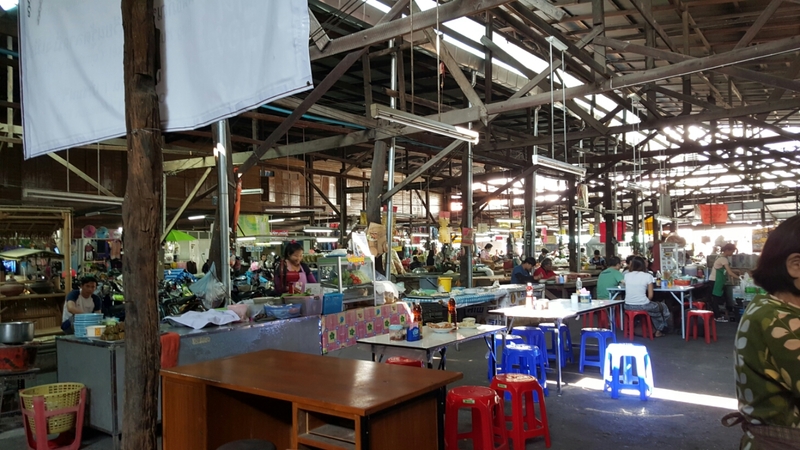 The typical one has a hole-in-the-wall feel – 8 or 10 tables, plastic chairs, and a picture menu hung on the wall or on the sign out front (though many also have laminated menus in Thai and English); food is made with the produce and meat on display in the front of the restaurant. The best food we’ve eaten here (and there has been a lot of it) has all come from these restaurants. Entertainment: Wandering around the city is about all you need – there are Wats, open-air markets, shops, and restaurants everywhere. Our cable has two English channels – one German and one Japanese, both with a thankfully small amount of US election coverage. But we also (clearly) have the internet and access to it is fast and cheap. Language barrier: Hellos and thank yous in Thai and smiles seem to get most points across, as do polite pointing and questioning looks. Most salespeople are able to quote prices in English or written Arabic numerals; if they are unsure, they just pull out a calculator. I learned to count to a hundred in Thai today in hopes of making markets simpler. Ants: Everywhere we’ve been in the tropics has ants (I’m looking at you Hawaii), and Thailand is no exception. Even on the third floor, the tiny critters find their way inside (leaving out a plate with the remnants of barbecued chicken was not the best idea, though it sat on the table for less than an hour). We keep things in the fridge as much as possible, wash the few dishes we have immediately, and use this wonderful ant-slaying chalk that is apparently illegal in the US (because kids). Just chalk up a corner or sill and the ants drop in itty-bitty heaps on the floor. How to pay for stuff: It is generally expected that cash will be used for transactions; we paid for our apartment in advance, so most of what we buy costs relatively little. ATMs that willingly take U.S. cards are everywhere, so we get a few days worth of baht and then break the larger bills at grocery stores and use the change for meals at smaller restaurants or for individual items from the market. The most useful denomination is 20 baht (the smallest bill) – most meals and cab fares are priced in multiples of this. The 1-10 baht coins are saved for laundry and filling water jugs. In general: Chiang Mai wakes up slowly in the morning and comes alive in the evening when people go out to eat and see friends and neighbors. In the morning our corner of the city wakes up to planes, the local dog pack, and bird and insect calls. We catch whiffs of tropical jungle coming through the windows. That scent can be replaced by exhaust (like in any city) and sometimes by a sewery odor (while sewers are covered, run-off drains are not always and these are used often used for dishwater and water from street and floor cleaning). Chiang Mai is a very international city, and that makes it easy to navigate, fit in, find people to talk to (even to see Star Wars in English on opening weekend), and find places that remind us of home (Beer Lab carries Deschutes and Rouge beers and we’ve seen Snoqualmie wine from Washington for sale). The Wat nearest our apartment is the beautiful Wat Suan Dok on Suthep Road. Also home to a Buddhist university, it is common to see monks in the streets (and even the local 7-Elevens) – and this is true with most of Chiang Mai since there are dozens of Wats in the city. Wat Suan Dok was built in the 14th century and houses a relic of the Buddha that duplicated itself as it was being placed in the chedi (stupa). 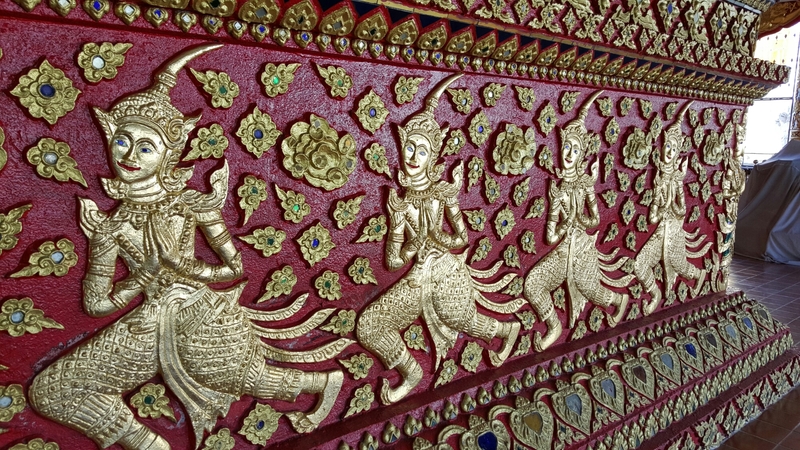 The second replica is now housed at Wat Phra That Doi Suthep, on a mountain overlooking Chiang Mai. Later this week we hope to take a red truck up there as well. Since it receives far fewer visitors than the Wats in the City Center, the grounds of Wat Suan Dok were peaceful and the main temple even more so. We came in a side door; the standing Buddha is at the back of the building. The seated Buddhas face east toward the main entrance and have a long hall in front of them that adds to the sense of space. On either side are seats for monks and donation boxes for contributions to restoration/groundskeeping funds and to assist the monks and students at the Wat. Most of the interior’s intricate detail is red and gilded gold, though the supporting pillars are blue mosaic and gold. Small mirrors are embedded and add to the overall ornateness. Chandeliers hang from the ceiling and are lit with CFL bulbs at night. Outside behind the hall, the chedi is over 150 feet tall. It was gilded in the last decade and is easily spotted from several points around the neighborhood. Dogs are allowed to wander freely around the temple grounds and are more or less indifferent to visitors during the day (though I suspect some of them are part of the pack that occasionally makes quite a racket around our neighborhood at night). Small bells on the roof of the buildings ring faintly with the slightest movement of air. An area near the chedi houses the remains of royalty. These relics were gathered to this spot in 1906 at the wish of the Princess. Many small, bright white mausoleums fill the northwest side of the courtyard. 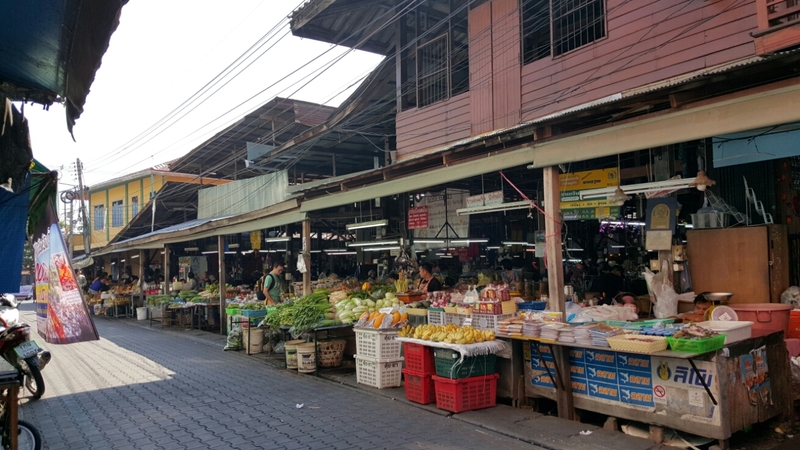 After seeing the Wat, we wandered west to a market near the corner of Suthep Road and the ring road and we picked up fruit and fried chicken from the vendors. Everything is fresh, including eggs (which, like Europe, are not washed, meaning they can be kept without refrigeration), veggies, spices, meat (cut to your specifications), and all sorts of freshly fried, boiled, and grilled treats. Stands with each type of product are generally grouped together, making it easy to compare prices and products. Motorbikes dart in and out of the narrow lanes, stopping only where they are blocked by tables of goods. It feels chaotic to us, but it seems like all the locals know just where to go for what they need. 9 Fresh eggs about $.77USD… no box needed! Today we spent the day learning how to make delicious Thai dishes at the Thai Orchid Cookery School in the Old Town of Chiang Mai. Our instructor was A, who showed our group of 8 how to make a full Thai meal from a selection of choices. For me that included fresh spring roll appetizers, chicken in coconut soup, panang curry, pad thai with prawns, and steamed banana cake. We jumped right in by heating veggies and sauce for spring rolls – just ignore the messy folding technique on my part and they are perfect. A showed us how to make stock for the soups using shrimp and veggies, so all we had to do was add a few final ingredients and we were set. It goes much quicker than the heavier stews and soups I am used to that simmer all day – just a few minutes to get the flavors in (and some more potent ingredients only go in for the last 10-15 seconds) and you are done and ready to eat! To break up the day, we went on a tour of the local market to see what the ingredients look like whole and a lesson on how to tell the some of the similar ones apart (three types of basil, for instance, and different gingers). A was also thoughtful enough to have samples of various fruits, so I can now cross trying durian off my list. It wasn’t as bad as I’d been led to believe, but it also isn’t a food I feel the need to try again. To me, it tastes a bit like something molding – a sewer or rotten silage perhaps. On the other hand, rose apples (crunchy and not too sweet, often eaten with a sugar and chili powder mix) and custard apples (sweet and creamy) were delicious and I’ll be looking for those in our future shopping. This class made me suspect I am even more of a spice/pepper wuss than I thought – A insists that most Thais can handle between 5 and 10 of the super-hot bird’s eye peppers in their curries… I only put one in the dishes where they were used…and I didn’t even slice it, just smashed it with the flat side of the knife to bring out a hint of flavor. I’ll have to try and up my game since I don’t want to keep embarrassing myself when we eat out! prairiewifegoeswest Create a free website or blog at WordPress.com.